Chickenpox is a benign viral disease of childhood, characterized by an exanthematous vesicular rash. It is an extremely common and contagious condition. It is caused by the varicella-zoster virus which is a herpes virus and contains a double stranded DNA in its center. Age group affected- 5 to 9 years. The infection can be there at other ages too but it is less frequent. It is highly contagious and it affects all races and both sexes equally. The attack rate is around 90% among seronegative persons. Incubation period- 10 to 21 days but is usually 14 to 17 days. Patients are infectious around 48 hours from onset of vesicular rash, during the period of vesicular formation (around 4-5 days) and until all vesicles are crusted. Transmission occurs by respiratory route. The virus is believed to be localized in the nasopharynx, in the reticulo-endothelial system. It then enters the blood. This stage of viremia is characterized by diffused skin lesions. There is the formation of vesicles that are initially clear but later become cloudy due to accumulation of polymorphonuclear leucocytes and degenerated cells along with fibrin. In the end, these vesicles either rupture or get absorbed. Most patient present with rashes, low-grade fever and malaise. This lasts for around 3-5 days. 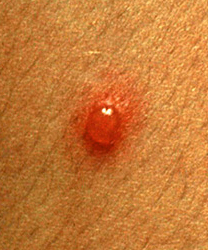 The skin lesions are characteristic for this disease. There are maculopapules, vesicles and scabs in various stages of evolution. This is shown in the figure below. There is shifting from maculopapules to vesicles over hours to days. Usually the trunk and face is affected and this shifts to other regions of the body. The base of these vesicles are erythematous and they appear in crops i.e. some are still developing while others are healing. The classical sequence is macules, papules, clear vesicles, pustules, central umbilication and eventually crust formation. The classical description of the lesion is a 'dew drop on rose petal' appearance. The rose petal refers to the reddish irregular papule and the clear vesicle on it is the dew drop. 1) The most common complication is secondary superinfection of the skin lesions with bacteria. 2) The CNS can be involved at times leading to acute cerebellar ataxia, aseptic meningitis, encephalitis, transverse myelitis or even Guillain-Barre syndrome. 3) Varicella pneumonia is the most dreaded complication. 1) Good hygiene - daily bathing, nail cutting. 2) Tepid water baths, wet compresses and anti-pruritic drugs for itching. 3) Acyclovir 800 mg 5 times per day or valacyclovir 1 g TDS for 5-7 days for adolescents. The dosage of acyclovir for younger patients is 20 mg/Kg 6 hourly. The disease can also be prevented by vaccination. A live attenuated varicella vaccine (Oka strain) should be given at the age 12-15 months and then repeated at 4-6 years.